Rising to a Challenge by Eve Sprunt, Ph.D. I have only one grandchild, Viola, who is not quite 3. It will be interesting to see if she goes into STEM. Both of Viola’s parents have Ph.D.’s in engineering from MIT. My husband and I both have bachelor’s and master’s degrees from MIT in earth sciences. I was the first woman to receive a Ph.D. in Geophysics from Stanford. Viola’s maternal grandparents both have degrees in pharmacology. Viola receives lots of attention that is frequently mingled with explanations of the scientific principles governing the world around her. 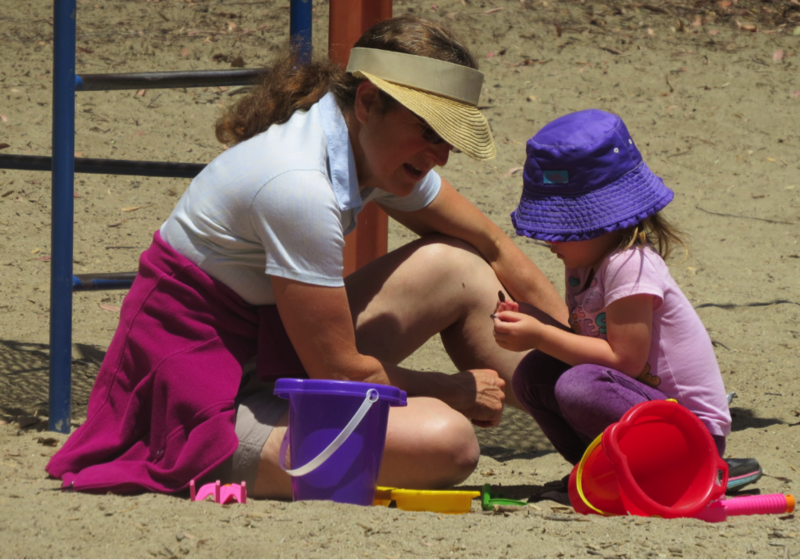 Figure Caption: Eve Sprunt explaining to her granddaughter, Viola, aged 2½, how to use a sieve to find buried treasure (coins) in the sand. In contrast with my granddaughter, I did not get a lot of attention from parents and grandparents and was not encouraged as a child to take an interest in STEM. As the second of five children (boy-girl-boy-girl-girl) born within an eight year time span, my parents didn’t have much time to spend with us individually. As a child, I was focused on competing with my older brother, David and trying to earn my mother’s respect. My mother was convinced that David was brilliant and repeatedly informed me that I wasn’t. My mother liked to recite to me a line from the nineteenth century poem, A Farewell, by Charles Kingsley, “Be good, sweet maid, and let who will be clever.” In her opinion, I wasn’t smart, but I was well-intentioned and worked hard. No matter how well I did in school, she attributed my success to hard work rather than brains. In sixth grade, I was thrilled when I was offered the opportunity to enroll in a special expedited program that would allow me learn the coursework of the next three grades in two years instead of the usual three. When I took the paperwork home to my mother, she refused to sign. I was devastated. My mother would not let me skip a year, because as she said, she “didn’t want me in the same grade as David doing better than he was.” David was just one year ahead of me, because he had repeated a year. Instead of getting to skip a year, my mother signed the form for me to be in a three-year “enrichment” program. Part of the enrichment program was a year-long course in earth science in ninth grade. I loved the class and bored my family explaining the geomorphology we saw on family trips. At the end of the year, I was surprised to learn that I had the highest score in my school on the state-wide exam for earth science and received a trophy. At the time, I had no idea that the joy I had in earth sciences could be translated into a career. No one in my family had ever attended MIT, but one of my mother’s brothers, who was a mechanical engineer, told my mother that MIT was the best engineering school. For many years, my mother dreamed that David would go to MIT and become a mechanical engineer. In her opinion, girls should study literature or art. David was given chemistry sets and construction toys, but he did not share them. The closest I got to chemistry was cooking. My brothers worked with tools, but I never did. I did well in high school and took calculus, biology, chemistry and physics. My father took me to visit college in Massachusetts. When he learned during our visit to MIT that the ratio of male to female students was then about 20 to 1, he decided that is where I should go. My impression was that my father saw MIT as a way to get me married to a man with good earning potential. Fortunately, I also wanted to go to MIT and was accepted under the early admission process. In the fall of 1969, I arrived as a freshman at MIT as a member of the Class of 1973, and checked into what was then the only dormitory for women, McCormick Hall. There were many events the week before I started class, but one of the ones that I remember most clearly was a tea given by MIT alumnae for the 73 freshman women in my class. Although it was meant to be a welcoming event, the message I took away was that I didn’t want to be like these women, who seemed bitter and disappointed. I received the impression that they had sacrificed having a family for their career, which subsequently had not lived up to their expectations. I concluded that no matter how successful you might appear to others, you rarely accomplish as much as you desire. My resolution was to have a more balanced “emotional portfolio” with both a family and a career. At the end of my freshman year, I was trying to decide on a major. I was thinking of physics. The freshman I was dating, who intended to be a geologist suggested that I investigate geophysics, because the course requirements were almost the same as physics, but without an undergraduate thesis requirement. When I looked into majoring in geophysics it reminded me of how much I had enjoyed my ninth grade class in earth sciences. At the beginning of my third year at MIT, I realized that I had amassed sufficient credits to graduate in three years. In effect, I now had the opportunity to skip the year that my mother had denied me in junior high school. However, I didn’t want to leave MIT yet, so I arranged to continue to study for a master’s degree earth and planetary sciences. My master’s thesis advisor, Prof. Brace, wanted me to stay at MIT for the summer to work on my master’s thesis, but Prof. Simmons suggested that I take a summer job in an oil company research lab. Prof. Simmons went beyond just a suggestion and personally referred me to a friend of his, who was an executive with the oil company. Prior to the summer job, I intended to pursue a career as a faculty member at a university. The summer job experience revealed an alternative that was very attractive. I decided that after I received my Ph.D., I wanted to work in an oil company research lab. When I went to Stanford, it never occurred to me to ask how many women had received a Ph.D. from that department. I was rather surprised to find about four other female students in the Geophysics Department at Stanford when I arrived, because at MIT I had usually been the only woman in my earth sciences classes. My study partner for the Ph.D. qualifying exam, was a woman who had been in the department for a couple of years. I learned a lot from her, because she was taking the qualifying exam for the second time. I was shocked and saddened when I heard that I had passed and she was being flunked out of the Ph.D. program after failing the qualifying exam twice. 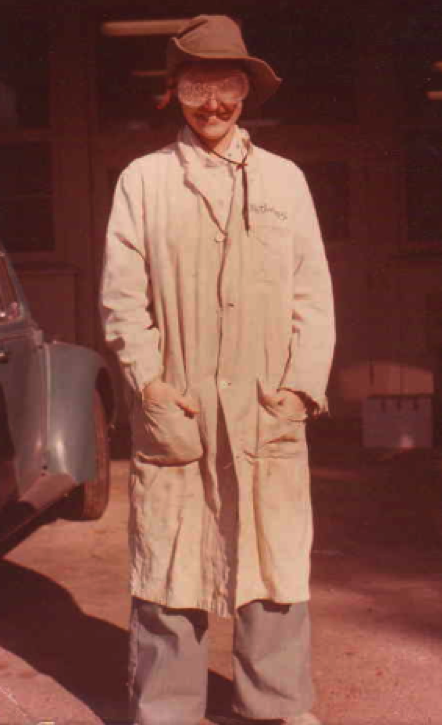 Figure caption: Eve Sprunt in 1974 at Stanford dressed for the messy task of drilling and grinding rock samples for experimental work. 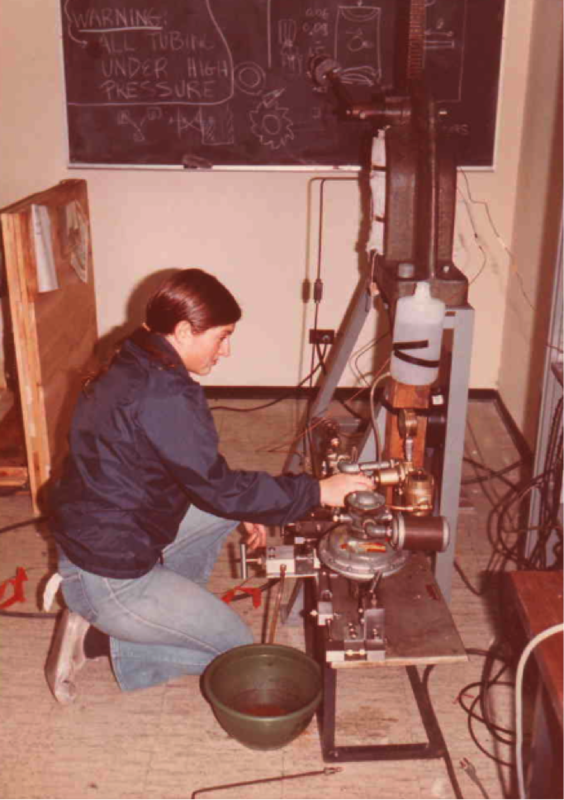 Figure Caption: Eve Sprunt at Stanford with some of the apparatus she used for the experiments for her Ph.D. thesis. Safety standards were not as stringent at that time. Eye protection is always advisable in this type of situation. Although at Stanford, there were only a few other female graduate students, I didn’t feel that there was prejudice against women. However, discrimination was a factor in the interactions with the oil company recruiters, who came to campus. During one recruiting event I met one of the other female students, who was in tears, because a recruiter had asked her, “What’s a nice girl like you doing in geophysics?” After that, I always wondered why I was never asked that question. The illegal question the oil industry recruiters always asked me was about my intent to have children. Despite the illegal questions, after my first summer job at an oil company research lab, I envisioned my future career as being in the oil industry. Prior to that summer job, I had intended to be a professor. When I finished my Ph.D., I received inquiries from Prof. Brace at MIT about whether I would be interested in a position at MIT. I declined, because I thought that a job in industry would be more compatible with my plans to have children. I knew about the seven year time frame to earn tenure and in the 1970’s, I saw that schedule as incompatible with my biological clock if I wanted to have children. I got married while I was working on my master’s thesis at MIT, but I didn’t think that I could handle a baby, while I was a student. As I was nearing completion of my Ph.D. thesis, I asked about continuing at Stanford, because my husband needed almost two years more to complete his business and law school degrees. I was offered the choice of being a research associate or a post-doc. I chose research associate, because the maternity benefits were better. I was lucky on my first attempt. My first child, a son, was born nine months after I defended my Ph.D. thesis when I was 26. As the first woman to receive a Ph.D. in Geophysics from Stanford, I had no female role models. I never asked how much maternity leave I could take. When my son was 13 days old, I brought him into work in a baby pack and set up a playpen in my portion of the office for him to sleep in. I strung up a sheet to provide privacy while I was nursing. My office was in the sub-basement, close to the machine shop. The machinist, Peter Gordon, was a good friend of mine, who had taught me how to use a lathe, milling machine and drill press and how to plumb high pressure systems. When my son became old enough to pay attention to the world around him, Peter would turn on the lathe so that my son could watch it spin. Years later when my son was getting his bachelor’s degree in mechanical engineering from MIT, there was a reception for the graduating students in the MIT machine shop. I shared with the machinists the story about my son as an infant watching the lathe spin. They immediately decided it was “imprinting.” My son had to put up with the machinists’ teasing about the imprinting, because he stayed at MIT to earn his master’s and Ph.D. degrees in mechanical engineering. As a child, my son never took an interest in stuffed animals. He was constantly building things. Art and drawing were of no interest to him. To satisfy, his fine arts requirement in high school, he built the sets for the school plays. He went off to MIT to be a mechanical engineer and never had any doubts about what he would pick as a major. I knew why my son asked that question, because I was closely following his thesis research. One of my biggest thrills was when my son was finishing his Ph.D. thesis. I was about to leave on an international business trip. My son had sent me his abstract and last chapter and wanted my comments before I departed the next morning. I asked him if he really needed my response and he said that excluding his thesis advisor, I had provided the most useful feedback on his thesis. I was amazed and delighted that I could add value, because my degrees were in geophysics and my Ph.D. thesis was completed about 27 years earlier. When I read his thesis, I thought about the similarities between his work on the nano-scale and what I had observed on the micro-scale in rocks. My daughter is four years younger than her brother. I tried unsuccessfully to encourage her to be interested in STEM. She just wasn’t interested. When we visited her brother at MIT, she said, “I can’t believe you let him go to such an ugly school?” I was amazed. I had never thought of MIT as ugly. I always enjoyed MIT’s infinite corridor and also, the views of the Charles River. I loved the intellectual stimulation and the ambiance of MIT. As a freshman at Dartmouth, my daughter enrolled in the courses required by medical schools, because she was considering a career in sports medicine. After the first couple of days of her freshman chemistry class, she felt hopeless and lost. We talked about the trouble she had with chemistry in high school and how she had hated it. Together, we decided that she should seek a different career path. She ended up taking the minimum number of science classes to get her degree. In our family of four, she was always the different one. When she was graduating from Dartmouth and heading off to law school, she shared that she had been worried that we could “make her go to MIT.” We laughed, because that had never crossed our minds. Despite her upbringing in a STEM-oriented household, she was not interested. She proceeded to explain that, in high school she “had managed information, because if we knew what she was really doing we would have worried too much.” I decided that explanation of lying to cover-up unauthorized activities was worthy of a future lawyer. While I was working as a research associate at Stanford and my husband was still in his degree programs, we proceeded with our plan to find two good jobs in the same city. Since I was more specialized, I interviewed well ahead of our target start date. The idea was that once I picked a location, he would limit his job search to that city. Young and unafraid, I scheduled my first post-maternity, on-campus interview at a time when I thought my infant son would be asleep. I walked into the interview wearing my son in a front baby-pack and announced, “This is the question you are not supposed to ask.” The interviewer, Ed Witterholt, of the long vanished oil company, Cities Services, countered by asking the entire family for an on-site interview in Tulsa, Oklahoma with baby-sitting provided. With no other standard for comparison, I assumed that was the usual practice. We had no relatives who could babysit for us near Stanford, so I took my son along on all of the trips for on-site interviews and asked to have childcare arranged. Based on what I subsequently learned about oil companies, I’m amazed that the companies complied with my request and that I received job offers afterwards. I had my choice of six job offers in oil industry research labs with 2 in Dallas, 2 in Tulsa, 1 in Houston and 1 in Connecticut. After I picked Mobil Research and Development in Dallas and obtained agreement that the position would be held for me, my husband limited his job search to Dallas. I thought the sky was the limit. There were warning signs, but in my youthful ignorance, I did not see them. When after negotiating a slightly better deal, I accepted the position with Mobil in Dallas, the hiring manager blurted out, “And, we are so glad you are a woman.” I took that as positive, whereas I really should have seen it as a warning. The oil companies were finally hiring women, but there were still many barriers. I think I was the third female Ph.D. that Mobil hired and the first, who had children. Before long, I was hearing things like, “We can’t have a younger woman supervising an older man.” Instead of being given positions that included supervisory responsibility over people, they created an activity leader position, so that I managed projects instead of people. Not having the opportunity to acquire personnel management experience later became a career limitation. About five years into my career with Mobil, a male colleague told me that I was of less value to the company than he was, because as a woman, I could not go to Saudi Arabia. I immediately proposed a research project for Saudi Aramco, the Saudi Arabian company that had assumed control for running the giant oil fields in Saudi Arabia from four major oil companies, Chevron, Exxon, Mobil and Texaco which at that time were continuing to provide technical support. Getting a visa for a woman to travel to Saudi Arabia without her husband is difficult, but about a year of being told I could not go to Saudi Arabia, I did, and I returned three more times. Over the course of my career, I have traveled to about sixty countries on business. My business travel has included many predominantly Islamic countries, Abu Dhabi, Azerbaijan, Bahrain, Dubai, Egypt, Indonesia, Kazakhstan, Kuwait, Libya, Malaysia, Qatar, Saudi Arabia, Tunisia and Turkey. I have had the pleasure of meeting female professionals in many of these countries. On several occasions the local women have taken their personal time to take me around their city to share their culture and experiences with me. 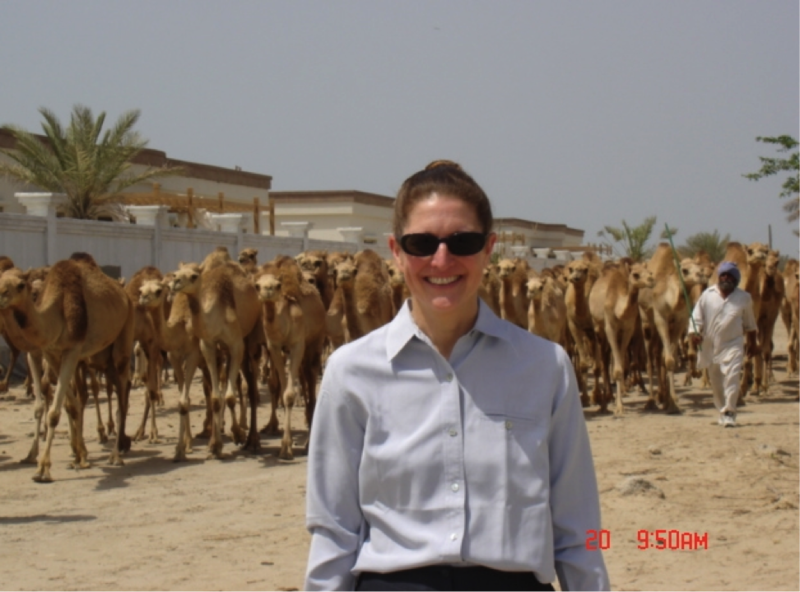 Figure caption: Eve Sprunt in Bahrain while she was serving as the 2006 President of the Society of Petroleum Engineers. This photo was taken in the capital of Bahrain, while Eve was being given a tour of the city by a female Bahraini petroleum engineer. As I learned in ninth grade, I enjoy understanding the processes that shape the natural landscape around me. The variety and beauty of natural landscapes continues to be a thrill. I have been to all seven continents with vacation trips to Antarctica and Greenland and visited over 100 countries. Business travel has a special charm, because I can engage with local people in ways that are not possible as a tourist. Also, I have had the opportunity to travel to remote locations that few tourists visit. Looking back, there are some things I could have done better, but overall I am pleased that I chose to balance family and work and to be an earth scientist. 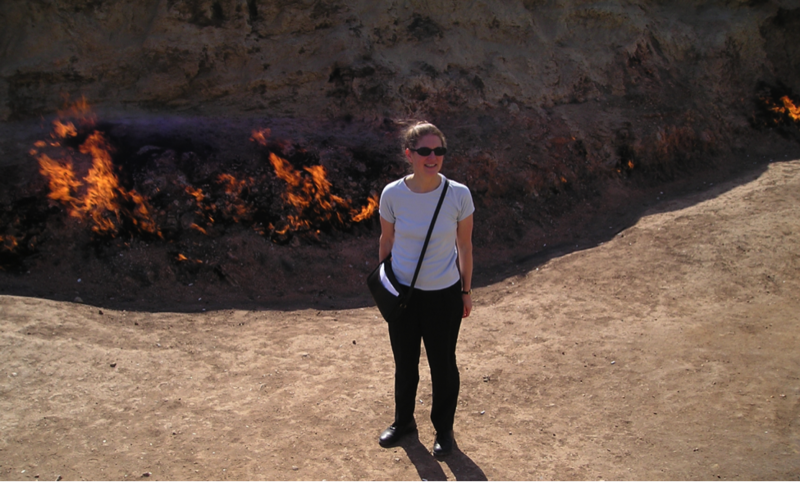 Figure Caption: Eve Sprunt on the Absheron Peninsula on the Caspian Sea near Baku, Azerbaijan where a natural hydrocarbon seepage is on fire. This site is known as Yanar Dag, which is translated as “burning mountain.” Flames from burning natural gas come from a thin, porous sandstone layer. Azerbaijan has long been famous for its eternal fires including the Baku Ateshgah, a Zoroastrian fire temple near Baku, which was a pilgrimage site prior to 1883 when hydrocarbon production reduced the seepage of natural gas extinguishing the “eternal fire”. Now a consultant, Eve worked for Chevron from 2000 through 2013 serving in a wide range of roles most recently as the Advisor, Geological R&D. From 2009 through 2012, she was the Business Development Manager, for Chevron Energy Technology Company. From 2006 through 2008, as University Partnership and Recruitment Manager, she managed Chevron’s worldwide recruiting and university philanthropy. Before that as the Senior Technical Advisor for Chevron Technology Ventures and Manager of the Advanced Energy Focus Area, she managed strategic research in non-hydrocarbon energy sources. Earlier, she served as Venture Executive in Chevron Technology Ventures for the Venture Equities and Energy and Power Funds. Her first role with Chevron was as Senior Science and Technology Coordinator, Health, Environment, and Safety, managing the corporation’s global climate change policy. Before joining Chevron, Sprunt worked for 21 years for Mobil Oil Corporation. She worked in positions in upstream new business development for 7 years. The first 15 years of her career, Eve worked in research and development in a wide range of technologies, including formation evaluation, formation damage, and hydraulic fracturing, authoring 23 patents and having a significant impact on the assessment and development of major fields. In 2013, Eve was selected as the recipient of the highest award given by the Society of Women Engineers (SWE). The SWE Achievement Award is “Bestowed for an outstanding contribution over a SIGNIFICANT period of time in a field of engineering.” She was honored for “game-changing contributions to the petroleum industry, to the science and practice of geosciences and petroleum engineering, and to the advancement of women engineers. A member of the Society of Petroleum Engineers (SPE) since 1980, Sprunt was the 2006 President of SPE. In 2010, she was selected as the recipient of the highest honor that SPE presents to an individual, Honorary Membership. She was recognized as a prolific contributor to the dissemination of technology, as an author, speaker and as a tireless SPE leader, including serving as SPE President. Sprunt is a 2000 SPE Distinguished Member and served as a member of the SPE Board of Directors during 1991–94. She also served as an SPE Distinguished Lecturer during 1998–99. Sprunt served as Program Committee Chairperson of the SPE Annual Technical Conference and Exhibition in 1988. 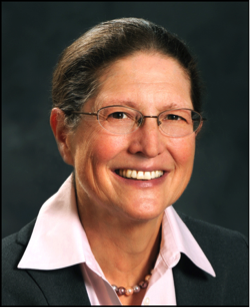 She holds 23 patents and has authored 28 technical articles, edited two books, and has written over 120 editorials for petroleum industry publications including SPE’s member publication, Journal of Petroleum Technology and Hart’s E&P. She is a founder of the Society of Core Analysts and has served on visiting committees for the Massachusetts Institute of Technology (MIT) and the Colorado School of Mines. Sprunt holds BS and MS degrees from MIT in earth and planetary sciences and a PhD degree from Stanford University in geophysics. Thanks to Jill Tietjen for soliciting this terrific post! I read this. Need to talk to you. Please call 970-925-6233..